Accusations of back biting and sniping to counter any anti Karanka opinion snacks of modern liberalism at its worst and are the sign of an argument on its knees. True loyalty to the club I would suggest comes via constructive comment that challenges the status quo. It is not, as it was decades back, blithely backing the club regardless of every failure and shortcoming. The Karanka shortcomings are well documented here – intransigence, inflexibility, bad buys, mass buys, lack of flair and goals, petulance, Leo and much more. It is extraordinary that anyone can see the Karanka’s tenure as anything but dead in the water. His was a peculiarly soulless promotion that limped across the line and his actions this summer and new season have been puerile and nonsensical. We cannot improve without a wholesale change in outlook and I can’t see any way of this happening without an immediate change of manager. At least half of the squad is not up to the Premier League and will need to leave irrespective of who is in charge so we might as well get on with it now. Steve Gibson has weight of responsibility that, I assume, no-one on this post can relate to. In 30 years I would say his only mistakes were to take on Strachan and his slowness in then pulling the trigger, ditto not putting Mogga out of his misery sooner. He must take similar action now. The Karanka era will not change, let alone improve. Look at how he treats Rhodes and has nullified, dulled, Downing. We have to take the financial hit and move Karanka out and I imagine Gibbo is feeling pretty sick about that but will know it is the only way forward. But we can’t wait. It’s unlikely that the next four games (Bournemouth aside maybe) will proffer anything for any boss, so get someone new in now and learn from this probable fallow period. As with Mogga and Strachan, the club will suffer from one man’s vanity that he can turn things around given time. Karanka won’t, he is not good enough, end of story. I don’t like polls asking whether the manager should stay but would like to see the Gazette, or national press, really press Karanka on his methods and how and why he thinks he will turn matters around. If such antagonism upsets the boss and sours relations with the club in the short term, so be it. Let us know what Downing thinks for example. Can we hear from Gibbo maybe? Or Bauser? As for a new boss, anyone but Sam obviously but it is difficult indeed. Ince, in the short term, maybe? Tel? Harry? Someone with the man management skills Karanka is oblivious to. We do have some good players, just let them play. Ince in the short term? Seriously, what would that achieve? Agree with all your complaints, because I am a fan, we suffer with every miss kick, every mistake, and there are plenty. But, and it is a big but. When you name some of the people who could turn up at Rockcliff as his replacement, the blood drains from the face, a tremor takes position of the body, and suddenly you know that he must be told to get on with it. I had to agree with him when he said’ writers, fans, ex players, old uncle tom Colby and all had every right to say whatever they wished, but that didn’t and could not help in any way to solve the problem. I think the Gazette got away with the previous poll because it looked like he could be leaving. It would serve little purpose now. Yes, I agree on both points Ian. Redcar – McClaren didn’t have a plan B against Steau or any other team. He took a desperate nothing to lose gamble, threw the dice and got lucky. That’s no way to manage a team in the premiership on a week to week basis. I don’t understand why so many people are complaining about our results, league position and managers ‘style’ because we are in a relegation fight. What did everyone seriously expect to happen this season? We’re not playing well enough to stay up at the moment, but there’s no reason why that cant change. Form comes and goes. We expected to compete against the crap teams (of which we are one) in our mini league and to not unreasonably pick up survival points against them. We have matched many of them but simply matching isn’t good enough. Coming in to this season we finished last season off with a series of unconvincing nervous edgy draws. So far we have been outclassed by Everton which is fair enough and dominated by Spurs until AK did utilise a Plan B, changed things by putting on more attack minded players and consequently gave the team and stadium a huge massive lift. If it almost worked against Spurs just think what it could have achieved against Watford! Form does come and go but our form since last April has been questionable and its getting worse not better. At this moment in time there is absolutely nothing to suggest that it will improve unless there is change in either formation (unlikely), selection (unlikely), tactics (unlikely) or ultimately in the Manager (unlikely). When and if the form comes I and many Riversiders will be delighted but right now somebody needs to explain exactly how that form is going to occur because after Sunday its become clear that the “treatment” of Rhodes isn’t nonsense, that Stuani is not fit for purpose as a Premiership wide right player, Barragan hasn’t the pace to be a wing back at this level. Our recruitment is extremely questionable and we have two very expensive experienced old Pro’s brought in to shore things up of which one is as predicted a catastrophic liability whilst the other is totally isolated, not just in the odd game but every single match because of tactical paralysis. Recruitment and 4321 now seem at complete odds or an admission perhaps that the recruitment quality was garbage. How on earth is “Form” going to come with the baggage all the above entails. We know we will lose more than we will win, we knew this season was going to be tough but we expected a fight. Now we are facing some real tough fixtures how on earth is our “Form” going to improve or could be sensibly expected to improve over the opponents we have faced in these first 8 games? Sunday was a step closer to Mogga at Barnsley, lost, clueless and helpless to effect anything even the absolute obvious. We are being told to stick together and keep the faith but faith in what? Formation (maybe), Selection (resounding no), Tactics (absolute no) or ultimately in the Manager (hmmm). I would be delighted if someone could come on here and put up a strong argument in defence of what we have seen to date. Unfortunately the best I see is sniping (that’s not meant or intended to be disparaging by the way) but nothing close top a constructive balanced argument. Please if anyone wishes to put a structured argument as to how our Form “will” not “might” improve go ahead. I and I would guess SG would be really interested and encouraged to read it in detail. the distress is caused by the missed opportunity in this first block of fixtures. Most fans saw that it was a great chance of having twelve points(brilliant) or ten, which would have levelled out after the four games coming up. they know that it is devastating to have surrendered as they have to the dross we have played. further, they know that we cannot play without a keeper in this league(present total of points dropped(oh, I would guess, maybe nine or ten). Hi folks, Ronald Chump here, I’m taking time out of my very, very successful presidential campaign to try to help you out with your own little campaign – People are telling me things are not going great for Team Boro right now – which such a shame. He may not ask me – though he’s be crazy not to – but I’m gonna offer some advice to your owner Steve Gibson, who incidentally is a great guy, even let’s his nephew play for the team – though he hasn’t got his name on the stadium yet – if you own something, I say better put your name on it before somebody steals it – it worked for me. Anyway, wonderful family, though they don’t talk about Mel so much these days – never trust a man in his sixties who wears that much leather – my hair dresser told me that, and he should know. OK let’s start at the top, now I hire a lot of managers – and I also fire a lot – so if they don’t get it then they know what’s coming – I could not be clearer. You employ them to be winners, not losers – I should know, I’ve been winner all my life, believe me. First they need a really, really good plan – and they gotta make it work, for sure. This Spanish coach has a plan doesn’t he? calls it 4-2-3-1, whatever that means? My people tell me he got the job because he’s a friend of Jose? who’s Jose? sounds like a man who doesn’t have that many friends – hasn’t even got a second name – he could be anyone – that’s no reason to get a job for me. I often speak with soccer players and they tell me things, your David Beckenham is a friend of mine – he said I know more about soccer than any living american he’s met, so trust me folks. Nobody respects 4-2-3-1 more than me, I love 4-2-3-1 – but what’s this all about with two holding midfielders? If I hire a guy to hold midfield then he’s holding midfield period – he doesn’t need another guy to hold his hand – either he can do the job he’s paid for or he’s history, believe me. Then what’s with the little stopper, what’s his name, Valdes – sounds Mexican to me – if he can’t reach to keep the ball out of the net, then maybe we need to build a wall in front of him and make him pay for it – sorry, I’m just telling it like it is folks – we want to make this club great again, don’t we? I heard he’s actually employing four keepers your Spanish Guy – and he’s only playing one of them? we need to check the rules on that one, for sure folks – we can do that. Anyhow, who’s been finding all these new players? weren’t you told they’d be better? They’ve certainly been paid to be better – just more broken promises folks. What’s with everyone in the team called ‘De’ – did someone have a dream or something – woke up and could only remember the ‘De’ part? seems like it to me – sounds like they’re working their way through the list until they find the right one – doesn’t sound like an organised way to run a club – don’t get me wrong, I like dreams but at least I remember mine – it’s the American dream! But you know the scariest thing about all this? your Spanish coach doesn’t even want to score goals – Why? What is it that he doesn’t like about goals? I’ll tell you folks – he was a defender – he hates goals – it makes him feel like a failure – I don’t know what that feels like – probably like not getting laid for whole year – I’m not going to even go there, believe me. The game supposed to be beautiful, right? Isn’t scoring goals the best thing about soccer? what else is there to watch it for? It’s a scandal folks and he’s been allowed to get away with it for this long, it’s criminal. So if you want Team Boro to be great again – start scoring goals and stop letting them in – it’s simple – but they don’t want you to know that, believe me, it’s a media conspiracy by disgusting journalists. You can have your club back folks, if you really, really want change, it’s going to be amazing – it’s time the little people were heard, trust me – god bless you all. Ah wait, ain’t we there already? Could I just take advantage of this lull to conduct a short poll please? How many on here have ever spoken too or written to their local MP? Or even know someone in their social circle who may have? I do know Paddy McCloughlin to say hello to, his lad played rugby with my son. That was 15 years ago!! I have written to my MP, too. Not being able to ‘see’ where the form is going to come from doesn’t mean it won’t come. I doubt Leicester fans saw the upturn in form coming which saved them from relegation the season before last. I agree that there is room for change, I like many others would like to see Traore starting a game, I’d also try Fischer at no.10 (I thought he was okay against West Ham) and Rhodes at no. 9. But maybe that would be too much change in one go. I’d settle for Traore as a starter for ten. Karanka is no fool, he knows something has to change, I suspect the biggest change required though is the subtle unseen one of players believing they can compete. The intangibles are the hardest things to spot and change, but can be the crucial factors. One thing I am convinced of, changing the manager part way through a season to be replaced by A N Other is not the answer. It might make us fans feel better by demanding a change of manager but its not the solution. ‘Karanka is not a fool’, agreed but neither is he providing any evidence he can manage the Boro to success in the EPL. Changing the manager did surprisingly well for Leicester Ciry last season and Sunderland. So, there’s two teams that I can quote, what about you Nigel? So, changing the manager for me is the answer. In fact, given we haven’t won a game at home since last April, it’s the only answer. Sack the manager and replace with someone who can bring a change in Boro’s performances. Spartak, you’re wrong. Leicester changing their manager had no impact on their form at all. Newcastle changed theirs and still got relegated. Research has demonstrated replacing a manager on average has no impact on form. The front cover of Private Eye after the Corbyn re-election was superb. It had a bubble coming out of Jeremy’s mouth saying something along the lines, great we can now unite and have a toxic fight together. That wasn’t a go at Corbyn or Spartak, just a reminder that for good or ill we are all Boro fans and need to stick together, a united front against the world. Meanwhile, in our own little goldfish bowl we can carry on debating. So Spartak here’s my challenge which manager would you replace Karanka with, who you know would bring an improvement in form? Yeh, I can see where you’re coming from, but I’m not sure he comes with a guarantee………. There’s no guarantee with any manager or player for that matter, Nigel. I mean look at Aitor, Bryan Robson, GS2, Stricken even Schteve. But I think Higgy fits much of the knowledge, character and high levels of motivational needs required. Ironically, he managed the Pools to safety last season and they’re in the mix this season for promo. Finally, I’ve never met him but I think the players would respond positively to his arrival. And just as importantly, he can’t fail to match or exceed the present manager in wins at home at the Riverside since last April. Be careful of what you wish for, it may come true! his foolish behaviour at boro was not a good sign of his abilities, more like one of the lads. shouting his mouth off, both before and after sent a shiver down the spine. Proper career management should have seen him with a top four club in the champ now, no sweat. Changing managers is no guarantee but in the case of the Toon they left it far too late to bring Rafa in when everyone could see they were spiralling but the forlorn hope that form was just around the corner kept McClaren in employment longer than was healthy. As a consequence they paid the ultimate price. Sunderland have changed managers more often than not and yet they are still in the Premiership by the skin of their teeth every season. Watford change managers more often than I change my undercrackers. Swansea now seem to be following suit. Crystal Palace it seems change theirs just about every year for the last decade. At the other end Liverpool have gone through a fair few of late not to mention Man Utd since Fergie went and of course their rivals across the City change theirs just to make a fashion statement, Chelsea are also not exactly shy in changing their head Coaches. Even normally conservative Everton shuffled their pack when things didn’t meet expectations. There are only four longer serving managers than AK in the Premiership, Wenger, Howe, Dyche and Hughes. Wenger is a legend in football but even Arsenal fans want him to move upstairs or somewhere else. Eddie Howe has overachieved at Bournemouth bringing them their greatest levels of achievement in their entire history, whats not to be unhappy with on the South Coast. Sparky’s time at Stoke has sailed close to the wind but he looks to be now steering them back up the table after years of keeping them staid but safe. Stoke are next away to Hull then Home to Swansea, that should make the table interesting for Boro! Meanwhile when we look at Boro I see very little to believe that a change is imminent unless its the ultimate one. No doubt SG will give Aitor as much time as possible and the next few games won’t make a great deal of difference in our end of season points haul given that on paper not many look winnable (or drawable in AK speak) but it will give an indication of how ready AK is to open his mind to the Premiership challenges and how capable he is in responding accordingly. **AV writes: I seem to remember most people on here and the wider football chatterati praising Burnley for sticking with Dyche as Burnley battled bravely before being relegated, saying it showed sensible long term strategic planning, they would be stronger for the experience and the club could bank the cash and come back better prepared next time. May 2016 Gazette headline ,Steve Gibson, “Boro will have a go in the Premier league next season ” ha ha ,its time to read the riot act Gibbo. The most frustrating thing is Karanka occasionally gets it right ie. the subs against Spurs which opened the game up and we looked lively at last but then the next game we go back to the same old team selections and negative tactics. For Gods sake give us a team we can be proud wheres that Teesside steel or has it been replaced by Spanish tin ? And to think Gibbo didn’t want to employ that German Manager for fear we would lose our identity…well this sure as Hell isn’t a team thats doing anything to improve the image of Middlesbrough. Interesting that having had a go at the team since Sunday the Gazette journos are rowing back a bit. I suppose they are supporters like ourselves and want the team to do well, they don’t want to stoke the fire. Have the team, and that includes the backroom staff, the skills and physical attributes to improve the offerings on the pitch or just as important, try it further up the pitch. Pre season a draw at home to Stoke as the opener, wouldn’t be seen as too bad. Winning at Sunderland would be expected. Draws at West Ham and the Baggies would have been ok. I would have expected Stoke and West Ham to be outside of our mini league. Out of the Baggies, Palace, Watford plus Bournemouth (to come) and Swansea, maybe be a couple within the mini league with the others in the mid table group. The mini league to consist of Boro, Burnley, Hull, Sunderland plus two or three out of the five I mentioned above. Everton, Spurs and Arsenal all in the top group. After ten games it should have been a spread of games throughout the league. The reality is that we will have faced three from the top section and seven expected to be near the bottom, middle or underachieving so far. Probably a win and a draw light of where I hoped we would be. The problem with this type of run is that you cant see where the next point is coming from never mind a win. Phew! A hell of a lot of reading to get through on here. I’ve said before that I never boo or shout abuse at the game but I do like to hear the views of others and, occasionally, contribute the odd comment on here. I said I was exasperated after Saturday’s display and I still am. I just hope that AK and staff can bring about a swift improvement or, at least, show some more attacking intent to give the fans something to cling to. You can’t expect continued unconditional support for what we have witnessed at home this season. On a positive I see Grant is back in training. Have to admit that at the end of last season I figured he would be one of the ones that would be replaced in the Prem but the fact I’m now very optimistic about his return speaks volumes about our recruitment. At least he will play with 100% committed passion. We’re in agreement yet again. You just wonder how we’d have fared without our expensive new recruits. Could they have performed any worse? I await the flak. “They” being the existing squad. I disagree – we proved to be better than Sunderland – who along with Hull we want to be aiming for 6 points from – I think these two will be cast adrift. After this, there are a few teams who we are probably pretty equal with and we need to be competitive with these (or “match”) – some we’ll win and some we’ll lose but the fact we’ve been competitive with Stoke, Palace, West Brom, West Ham and Watford indicates to me we have a chance. Yes, I hear you say “how many of those games have we won” but we could (and should) have won at least one of them. If we’d been getting smashed every game I could understand the angst. There was a post earlier on which summed up Saturday very well – up until the goal I was happy enough with our performance – we were dominating possession and had created the best chances. It was after falling behind where we disappointed and AK didn’t do enough to change things. The last 15 (including the +6) were particularly poor. And I don’t think anyone would disagree that Rhodes was brought on too late. The article on the Gazette website was spot on when they say we are in for a long season if people are going to get upset everytime we lose. We are going to have more defeats than wins this season. I really don’t understand why some people seem to be so angry. Speak for yourself. I enjoyed almost every minute of last season. If you find a promotion season ‘soulless’ I’m not sure when you will be happy. Don’t we have to score goals to win matches and to do that don’t we have to create chances and work the Keeper. How many worldies have Premiership opposition Keepers had that played against us this season? Absolutely none, because we haven’t given them anything to do. Our on target strike rate is poor and Sunday was disgusting. AK doesn’t have the tactical acumen or the correct players to attack and score goals and its not just this season. We achieved in the Championship because of setting a record for clean sheets not because of scoring or creating chances. Why on earth would three seasons of “form” suddenly change now unless AK radically changes (as he did in the last 20 minutes against Spurs). We had our gentle start with a relatively easy run of fixtures and couldn’t hurt the teams that mattered apart from Sunderland where we ended up so dominant that we won by a margin of a single goal. We had an opportunity to beat both West Ham and West Brom and AK bottled both. When was our last home win at Fortress Riverside? Goals win games not passes! We have to be better than three teams not just Sunderland. I still think we played well enough against Watford – until they scored. Then we lost trust in our own ability. RR – all we need is to cut the silly mistakes, stop giving cheap goal and a bit of luck. I for one see that we can only play better, not worse. The system is OK, our players just need some faith – and self-belief. I will still continue to enjoy the season. I don’t think SG will do anything before Christmas, though. And I believe in AK, too. Boro have not been beaten by four goals this season. Sack Pepe Guardiola now. He is useles and don’t attack enough. The Spanish coaches do not understand the modern game. Sack them all. We’ll have to see if that’s still the case after Saturday. Arsenal away is never a game I look forward to due to the fact that when they play well they are practically untouchable and for some reason they seem to play particularly well against us. I’m just hoping they’ve got scoring goals out of their system after scoring six tonight. Strange that, a relatively decent keeper, not great but OK, disrespected and dumped to bring in an ex Barca Keeper with alleged “great skills” because he once played for Barca who lets his side down. Sound familiar? With City Guardiola will be sacked have no doubt about that if it continues, the clubs owners have history on that. For some reason they expect their team to win when they back their manager with the players he wants. Just seen the highlights of Barca against Citeh. Joe Hart will be sat in Italy, trying not to break in to a smile, then a smirk, then a chuckle, then a laugh, then a guffaw, probably sat in an Italian ambulance with broken ribs due to stress fractures. Pep wanted a goalie who could pass out from the back, sad thing is he forget to write in to the job spec he had to pass to his own team mates. Makes Valdes look like Gordon Banks. Just watched the 6 Arsenal goals tonight with thoughts of our dynamic vertically challenged Keeper facing the same on Saturday. Perhaps there will be an unfortunate thumb sprain picked up in training on Friday. On a really sad note Gary Sprake who we were only talking about on here recently has sadly passed away. Another of my youthful football legends gone, RIP Careless Hands. Seriously, I wouldn’t like to be in the trenches with some of you lot. You’ve given up already. You call the players and the manager but you spineless faint-hearts have folded as soon as the going got tough. Mind, most of you (you know who you are) gave up last year when the pressure was on and decided we wouldn’t get promoted and the team wasn’t good enough and you spent the run-in moaning and critsicing. This season was always going to be a scrap. In a scrap you stick together. Basic. Wind your necks in for a while. **AV writes: I’ve changed a word in that. Little tweak. Turn the temperature down. That may carry some credibility were it not for the fact that what is unfolding was predictable. ” Meanwhile we will be hoping our lone striker scores from his solitary chance on target, watching Stuani and Barragan plodding along the right and a Keeper terrified to catch a cross. A win with this squad and these tactics would be the last thing I would expect. It has bore draw written all over it, unless Watford provide some intent”. Its incredible that Sunday’s incompetence and inabilities was accurately foretold more than two weeks before the game itself actually kicked off. What an asset that would be in the trenches! Its not us “spineless fainthearts” who have given up. 40 years supporting, watching Boro “entertain” Oxford and Luton at Ayresome Park does not constitute giving up. Watching Blackpool on a cold Tuesday night in a three quarters empty stadium is not giving up. Staying to the bitter end against Steaua is not giving up. Watching us win our first ever and only trophy is not giving up. Giving up is when you resign your fate as inevitable and just take whatever unfolds before you as acceptable, that is the sign of someone who has actually given up and just along for the ride wherever it goes. By your logic I suppose that Southgate, Mogga or Strachan (who actually gave up himself) should still be here then and not given up on? Kris Boyd would have eventually scored the goals to lead us into the Premiership along with Killen and Flood? Should we not have “given up” on them? Justin Hoyte? Marvin Emnes? where exactly do you draw the line for giving up? I doubt very much any of us who post on here have or would “give up” be they “Plemain” or “Plexit” otherwise we wouldn’t bother posting. Personally I would rather be in the trenches with someone who is aware of what is unfolding around them than someone who just blindly accepts fate without question, that really is surrender. Can’t see much evidence of scrapping ! Michael I think that is perhaps a bit unfair, what about Valdes and Clayton or Valdes and Chambers, plenty evidence of scrapping! Just floating in a cross for the Keeper to spill and an easy toe poke for an Antipodean Striker. There’s life in the old shed yet. The tap min master returns with a late (very late) 200 strike! Very disappointed in our Southern Hemisphere contributors, obviously still passing it around in their own half. It’s not just about shots on target though RR. You could dominate a team for 90 minutes, have 20 efforts from 5 yards out skied over the bar and that would be no shots on target. But you couldn’t say that team didn’t create enough. Up to Watford’s goal we were the most likely to score and we should have done. Ramirez and Forshaw’s chances in particular. (can’t remember if Negredo was before or after the goal). Not gilt-edged but chances that should be taken at this level. You asked what makes me think we’ll turn it around – if we start taking our chances and making the most of our possession and opportunities, we will. If we don’t, we won’t. You can disagree with that if you like – but that isn’t ‘blindly accepting fate’, it is having belief in this team and manager based on what I’ve seen this season that they are capable of turning it around. And I’m determined to enjoy it regardless – otherwise, what’s the point. BP from where I was sat I thought we had played our best 25 minutes of football in the first half after weathering a 5 minute opening from Watford. We kept possession and stroked the ball around passing and probing but there was no end product. After the Ramirez attempt (probably our only serious opportunity) my only remembered incident in the first half was Ben’s shot from distance that went past the post. I’m sure (hope) there were more efforts but I can’t recall any that had me off my seat. When I watched the game back on the box later on from a different viewing perspective I seen all our possession but it was completely negative with no penetration. The Ramirez chance aside there was nothing apart from Forshaw’s weak effort straight at the Keeper in the second half. Stuani’s shot was taken quickly and off balance, de Roon’s header was leaning back, stretching and he done well to even get his head to it. It was very poor fayre and the National Press quite rightly went to town on us. The Bookie’s responded by pushing AK up the sacking charts. If we take our chances yes we could improve but we are not creating enough chances and haven’t done under AK. Against lesser opposition 1-0’s are achievable but at this level our restricted creativity is a concern and one that hasn’t been addressed (arguably it has with Fischer and Traore) but I don’t think our squad is balanced and I think AK’s team selections compound that. Ramirez for instance is coming in for some stick but I reckon that with Nsue out wide (admittedly I would have preferred Albert or better still a signing that captured the imagination on the flanks) or Traore he would have pacy options to pass and interchange with and bring into play. Negredo has been a highly overpaid flop but I can’t criticise or blame him until I can see what he can do which requires service. Two up front or one up front is up to the Manager, I don’t care so long as its effective. Our best and most entertaining bit of football for me wasn’t the Sunderland win but the twenty minutes with Rhodes and Stuani up front against Spurs. That was to AK’s credit but we have had 8 games and only twenty minutes of intent. I can’t enjoy what I’m seeing unfold when it is so predictable knowing it isn’t going to work or change. I genuinely wish I could be more like yourself and Jarkko and just enjoy the season but I can’t and I can’t become a Manchelskiarsepool supporter either which would be the easy option. I want to see us play to our maximum potential but I don’t believe AK has come close to delivering that this season. If he turns it round then great but Sunday was a retrograde backwards step showing that nothing was changing or about to improve. That futile Rhodes substitution was the straw that broke me and many others sitting around me in the North stand. our major problem is not having shots on target, some average keepers have had an afternoon out against us. No, me neither. Would Kammy’s fighting beavers help in the trenches? Whatever we say on here it is up to the team to turn it round. That includes the coaching staff. The recruitment team must be sitting there rather glum at the moment, I posted we had built a squad to battle with the lower half of the table, we just look torpid in our play. What is a concern is whether what we have in the squad is better than the current misfiring starting 11. We cant allow the season to meander without finding out. The trip to Arsenal is not going to give us any freebies but there is a glimmer of hope, the after the Lord Mayors show syndrome. After a super performance there can be a bit of a let down in the next game, often against a gimme opponent. Do I think it is going to happen? No, I think the odds are something like 11/1 for us to win, I wouldn’t put Vic’s #daftquid on it. I agree we didn’t create enough chances (based on our possession) – but we still had enough good ones to score. Ramirez, Negredo and Forshaw all should have scored. But – we had a lot of the ball and we also got into good crossing positions and wasted it. That suggests to me we aren’t a million miles away from winning games. A better taken chance, a bit of luck, some more direct passing and/or some better delivery from wide areas and we turn draws and defeats into wins and draws. It sounds like you agree the potential is in the squad – so again, I think you answer your own question about why people think we can turn it round. AK has a responsibility to get the right players on the pitch and in the right mindset but when they are out there it’s up to them and they have to take the responsibility. Ultimately, the bookies always win (or so it seems) but they had Leicester City down to be relegated last season and that certainly didn’t happen. Well, glad you asked sports fans. Occasionally, perhaps rarely, the most surprising of things happen and this seems to be a year for those big surprises. Maybe Trump becomes President of the god old USA, maybe Man Utd get relegated (at the end of the season), maybe Boro win at the Emirates on Saturday. At this point in time you can only judge the preceding on the evidence you have at yer disposal. So, what are the chances? Which one of the preceding is most likely to happen? You could list them in order of most to least likely, if you wished. I won’t ask for replies as I’m sure you probably prefer to keep it to yerself. Still, I reckon Trump winning the US election in three weeks and Man Utd getting relegated is more likely than Boro beating Arsenal on Saturday. Call me a whinger, doom monger or simply some other derogatory name as you like. Some would probably suggest I was simply being realistic (not good enough for some Ultra’s). And so it is with Aitor and the Spanish posse. You can just about guarantee it will be circle the wagons and backs to the wall against an Arsenal side that are gunning for the EPL Champions accolade this season beyond many and a nice send off for Wenger. That’s got massacre written all over it for the Boro. Whereupon, many Aitor supporters and the Ultra’s will pipe up with ‘Well, there just not in our league’, again. But here’s the nutty crunch sports fans – at what point are we supposed to meet someone in our league and will they be so kind in allowing us to play pretty football and score the one goal we need to win. Because it would appear the present manager is sticking with his ways and we have yet to see a win since the second game of the season. I will of course disassemble it when autumn passes to winter and the snows come down from the heavens. I wonder if by that time the Boro will have a new manager? Time will tell sports fans. Time will tell. That’s all for now from your very own Spartak Boro, writing to you from the interesting but calm region of the White Carpathian Mountains. I agree this season has been predictable, but for different reasons. Virtually all promoted teams struggle to survive season one, we know the stats, Boro are no different. Where we are after eight games isn’t because Karanka is incompetent. Nigel – Survival was inevitable and always has been for every newly promoted side, that is more obvious than predictable. 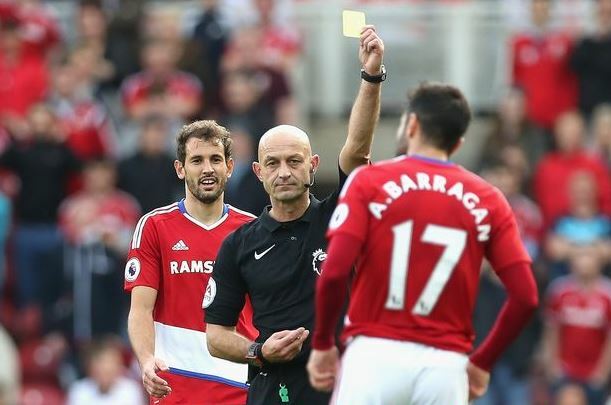 On Sunday Aitor was both incompetent and inflexible but worst of all deluded. The delusion even continued after the game about time wasting which he and Leo have certainly worked to their advantage on many occasions. As BP said above I think our squad is better than where we are after 8 games, not good enough but better. Its just that with AK’s utilisation and selection of his available resources along with how he structures them is limiting us. That said the squad should be better than it is and at least 25% of them shouldn’t be anywhere near a Premiership side, that part is not all AK’s fault but what he does with the remaining 75% is his responsibility. A striker on an a rumoured £100K a week not being brought into games is unforgivable. A Goalkeeper who probably earns more in a month than Dimi earned in a Season yet shows no obvious improvement defensively is a very expensive folly. Our only right sided wing back being dropped to accommodate a solid if unspectacular defender when the 4321 system requires wing backs borders on insanity. A Striker with no pace, no defensive capability, no trickery and poor delivery then being played in front of the same defender wide right in the same system takes that insanity to a new level. That the above was predicted by me two weeks prior to the game yet delivered almost word for word either makes me a genius (which I’m not) or AK stubborn and predictable. Incredibly if I can spot these flaws I’m pretty sure that all the other Premiership clubs and their data analysts can see exactly the same. Even with all the above addressed we would still struggle but when we are being impeded by the Coach who is supposed to be leading and inspiring its difficult to just sit back and believe that things will somehow improve without some change (I’m not saying we have to get rid of AK). A few weeks back he was saying about Ramirez and Negredo being dropped and how they would respond, well if that was a response god help us all. Rhodes came on at Spurs and helped changed the game along with Traore. At West Ham Rhodes and Fischer done OK, not great but certainly no worse than any Ramirez and Negredo performances this season yet were dropped. If Fischer and Traore are not ready then why are they here and why are they in a 25 man Premiership squad? Negredo has proved nothing to date (Managers fault or the Player?) yet Rhodes don’t get a sniff. Is Nugent not a more suitable wide playing striker with his pace than Stuani? I have the uncomfortable feeling that had his surname been Nugento we would have seen a lot more of him. Is it because of a fear of being asked to justify why we are paying certain players X amount to sit on the bench when its looking like we already had players on a quarter of those costs (and less) already here and as good or in reality like Forshaw better. Whatever the reasoning and logic the result is we are seeing a side that is not performing to its full potential and that for me is inexperience, incompetence, bias or just a lack of ability, whatever way you want to dress it up. **AV Writes: Your ‘rumoured’ figures on Rhodes wages are waaaaaaay out. The “not being brought into games” was aimed at Negredo on the pitch not Rhodes on the bench. Negredo is isolated and surplus on the pitch. Negredo I’m guessing is on £100K a week, Rhodes I would imagine is on nearer a quarter of that. I wonder if Hull or Burnley fans are so upset at the moment? I suspect not, and I’m not really sure why. Because, Borophil, its simples, we consider ourselves to be a cut above the two aforementioned teams, whether that is a truism or not – our expectations of our Spanish Real Madrid manager are higher, we’ve invested more in real money terms and we get bigger than average crowds etc., etc., not difficult to understand really. Craft knives and razor blades have been banned from sale in Humberside along with pitchforks but that is pretty well known. I have no idea what Burnley fans think and not particularly interested. Makems have just about resigned themselves already to the drop. Baggies fans are less than impressed along with Stoke fans and Swansea fans are anxious and nervous. Hammers fans are ecstatic about their new ground and performances there this season. Chelsea fans are calling for Conte’s head and there has been ongoing mumbling in one half of Manchester about their goalkeeping choices (can’t possibly think why). Arsenal fans and their feelings are well known and well recorded. Borophil – I reckon a faction of them will be, its a trait of many supporters to slag off the manager/chairman/training ground cat. Creates a scapegoat and its easy to blame someone rather than accepting surviving/thriving in the premiership is an incredibly tough thing for a promoted side to do. 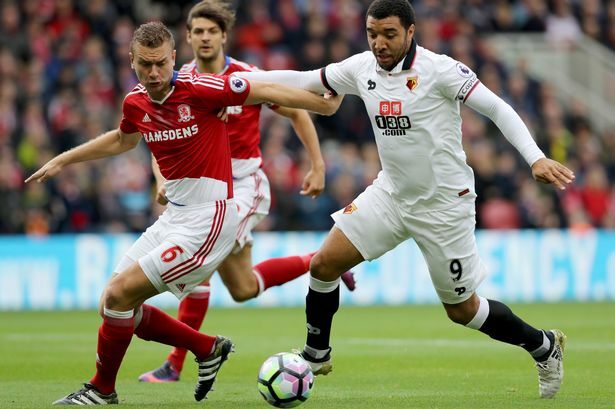 RR – who had the better chances on Saturday – us or Watford? Watford, they scored we didn’t. We didn’t create any goal scoring chances bar the Ramirez miss. so Holebas’s was a better chance than Ramirez’s or Negredo’s or Forshaw’s? The net bulged so yes. Negredo’s best chance was when he nearly put it into his own net clearing a corner, Forshaw’s was a timid pass back straight at the keeper in the middle of their goal. Holebas hit his shot accurately into the top corner. We had two of them from Forshaw (again) and Stuani, both ended up in row Z. Only Burnley have less average attempts on target than Boro in the Premiership, even Sunderland are averaging more attempts. At best I would say our chances were borderline half chances and that is being kind considering that Watford hadn’t kept a clean sheet all season. We are not creating chances, we are averaging 2.38 shots on target per game, the second lowest in the Premiership, those are not my figures those are independent Stats. Borophil, with all due respect you’re clutching at straws – we lost, period. And chances are we will lose on Saturday (realistically speakin). That’ll be 9 games and 1 win! How many more would you have us add before the penny drops? They had the chances and didn’t take them, a familiar story throughout last season as well. We have got to improve our goals/ chances ratio. I don’t have the answer but it’s up to AK and co. to find it, otherwise the downward trajectory will continue. Your glass is always half full. Others are half empty, probably because we have been following Boro for 50 years plus. We form a judgement on what we see, week in week out and call it the way we see it. We all want Boro to succeed and I believe we can survive in this league if we show more attacking intent. see above. It’s not chances, it’s shots, we would have passed to a team mate rather than shoot had it been us with their goal. We may have to play twenty minutes before we get a real chance of scoring, but our players refuse to shoot, so that means four shots in the whole game. Strangely enough that is about the size of it, ring any bells? It’s like talking to a politician! I’m not asking about what we did with the chances, I’m asking if we had the better chances. I feel like you missed Negredo’s – he was one-on-one and fell over the ball. It was much more than a half chance and one I would expect someone of his quality to put away. My point is – we had more possession than Watford, we had better chances than Watford. But we didn’t take advantage – yet you call AK the incompetent one. Don’t you think the players should take some responsibility? And if we had more possession and better chances it isn’t a huge leap to think that our form might turn and that isn’t just ‘blind faith’? How many chances do Watford create on average? How did that compare to Saturday? Does ‘incompetent’ AK get any credit for that? More straw clutching – more simples! A manager succeeds or fails on the basis of the teams delivery on the pitch. That goes for all managers regardless of level from Conte to Guardiola, from Aitor to Higgy at the Pools. He puts the team out. He instructs them. If they fail he can change them whenever he so wishes – that’s his job, that’s what he gets paid for, that’s why he’s there. If it doesn’t work out he’s gone! Spartak – That really is a rubbish argument. Would u like to expand on that opinion Nigel or are, as the Americans say, just sore with me? Or maybe you don’t like the idea of a manager being responsible for the quality of work his/her team produces? We had three attempts on target and they had two. We had all the possession but in our own half and centrally. Possession is worthless if you do nothing with it which we didn’t and habitually don’t (sideways and backwards possessive passing has become an AK trademark). Barca had 53% possession last night against City and scored 4 goals, we had 64% against Watford and didn’t register a solitary goal nor looked like it. Over the season Watford are averaging 4.25 shots on target which is one reason they are higher up the table against our average of 2.38 shots per game average. To avoid the “Politician” label, no we didn’t have the best chances, both sides were dire in that respect with just about the entire nation switching off or switching over. There were no good chances at all in the game apart from one decent strike which was well taken. Of the bottom 8 sides in the Premiership table 7 of them are in the bottom 8 for shots on target. 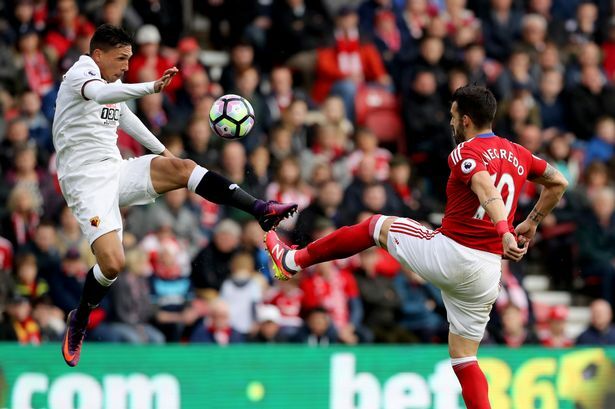 Only Swansea break the mould which would indicate they are the most likely to break free and ominously Stoke are also climbing up with attempts on target. Unless we improve our attempts ratio we are unlikely to score enough goals unless we have a Striker with a phenomenal conversion ratio. To say we didn’t have the best chances is just factually incorrect I’m afraid – ironic since you are so keen on quoting stats. Chances are an opinion not factual, nothing ironic in it. We had three they had two. To argue our three chances were better than their two is hardly credible or an endorsement either way, both sides were garbage as were the chances apart from one, theirs. so we are in agreement that we at least matched one of our rivals on performance and topped them on chances created. so can you see why I don’t see it as a massive stretch that we can turn our form around? BP I agree we can turn it around but there has to be a change, an acceptance or willingness to fine tune, tweak or alter a little bit, to be more creative, less aversion to risk. Playing the best players in their best positions would do for a start and providing service to our well remunerated Striker. the reason strikers get paid more than any other player is for a reason, they have a magic gift of reacting in the box before anyone else. It is a gift, believe, to get their (typical) twenty five goals a season is truly the difference between a great season and disaster. No club worth the name rests easy until they have their striker, and tied to a long contract. It does not matter how many times you get the ball bouncing on the penalty spot with three people lashing at it, without the gift the damned ball will stay out. this is not only us, its every team without a striker, and we are not playing our striker, dumb, or what? I vaguely remember about a year ago, we were looking for a striker, someone on this blog said, and I quote, ‘there are possible targets one of whom is this young up and coming fellow Charlie Austin,’ he then said that any careful weighing up of the pros and cons was pointless because the only stat that mattered was damming in it’s finality. His strike rate was off the scale, something like ninety goals in one hundred and ten games. Level played at is of no consequence when it comes putting boot to ball in the box. He went for a price well within our reach, and he is still scoring for fun. I think the complaints are still about the performances. The current results are as a direct consequence of the negative performances. The discussions have centred around possession, attempts on target, creating chances, team tactics, team line ups and omissions, plan b’s, recruitment, goals or a distinct lack of them just to mention a few. For the benefit of balance and to show that I’m not looking for negatives just for the sake of it there is a very strong and optimistic defensive positive in AK’s favour which shows that shots on target against us puts us equal with Tottenham and Man City, ahead of the likes of Arsenal and Man Utd and only behind Southampton, Liverpool, Chelsea and Everton. That augurs very well if we can keep that going but it is totally pointless if we don’t create, threaten and score at the other end as we are seeing in our league position. There is the counter argument of look who we have played so far and that may radically change over the next 5 games. There is also the issue of with so few shots on target then why so many shots have led to goals? In very simple terms we are not good enough at the moment across the board in all aspects of the first team from manager down to the 25 players in the squad. If the squad and coaching staff believe they have to change things then it can happen. If they all sit in denial then we are stuffed. They may well not come out and own up to any changes but it will be evident on the pitch. It could be as simple as a change in tempo or an odd player here and there. We do not know what is being worked on at Rockcliffe and what changes are mooted. I would be pleased with a bit more mobility from front to back and a forward facing approach. I don’t expect us to be on all out attack but I do expect a bit of purpose in our play. You cant expect Ramirez or Negredo to do anything the way we are playing. That sort of theme runs throughout the team, the whole is not greater than the sum of it’s parts. The table doesn’t lie, we are in the part where we belong. At the moment you wouldn’t bet against a bottom four of Sunderland and the three promoted clubs. At the moment is the key phrase. Over to AK and his merry men. No doubt if Traore starts at Arsenal, Barragan is told to not cross the halfway line and keep a tight back four, Nugent played as the lone Striker, Clayts comes back in alongside Forshaw, we defend deep, break away at lightning pace, nick an undeserved goal against all the stats and AK will be lauded a Hero and that he knew what he was doing all along and we are all numpties for disbelieving. I’d be delighted with that scenario but the likelihood is that that is not going to happen unless of course he decides that he has nothing to lose whether its 2-0, 3-0 or 4-0 it is what was expected so he may as well be hung for a sheep as a lamb. Its the apparent denial that concerns me most. I take your point here Ian but surely there is an issue for Gibbo to manage his manager. That’s not his style though as we’ve seen with Robbo, Southgate and Strachan. Not too sure whether to include McLaren and Mogga in that list so, for the sake of simplicity, have left them out. Listened to Neil Warnock on talksport this morning. Was interesting hearing his take on Cardiff and their struggles. He was talking about the squad being lopsided in terms of personnel. They then asked him about the Newcastle away match and how he felt about that saying as it looks like Newcastle will run away with the league (there words not mine!). Warnock’s response was that these are the games he loves, the opportunity to challenge yourself against the better players. He said that quite categorically he will not go there to defend and try and get a 0-0 because when you do that against the better sides they just pick you off at some point. He said he’ll be going there trying to get three points and that you need to put the opposition on the back foot and instead give them something to think about rather than allowing there confidence to grow. Was just funny to hear as maybe I wish that we had a bit more of this attack minded instinct in our team, particularly when we have the calibre of players up front such as Rhodes and Negredo. Coincidentally, I think the reason why we are not one of the three favourites to go down is due to the quality of the players we have at our disposal and perhaps they are underachieving as things stand. I think something very similar was said last season! ‘their’ not ‘there’. My English needs some work!! The problem is that if Gibbo needs to manage his manager (and by implication the football side as a whole) then it is a lost cause already. With McClaren, I believe it was Gate and JFH (?) who got that squad going after seasonticketgate. Robbo asked for El Tel’s help to turn things round. That is playing with purpose. Ian’s post at 12.56pm sums up,the reality. Clearly BP sees things differently to RR, Spartak and the rest of us “moaners” and he’s entitled to do so. What seems clear is that, on the rare occasions we play a pressing game, we look good enough. All we’re asking for is more of this. If we lose, so be it, but at least we’d be “giving it a go” , which is what we were told we’d do. I think the ‘giving it a go’ is generally being misconstrued. Gibson surely just meant we would be trying to stay up (obvious perhaps) – he wasn’t alluding to how we would play. Personally, I think we’ve given it a bloody good go so far and have fallen fractionally short in a few games. Just to be precise BP – we’ve won 1 game in 8, maybe’s on Saturday that’ll be 1 in 9. We’ve got two points from the last 6 games and scored 4 goals. We’ve dropped 16 points out of 18. But then I could be just moaning! From all the games I’ve seen either live or on TV this season not once do I think we’ve lost or drawn when we should have won as a result of poor selection or tactics. Against West Ham we drew because five of our players allowed a striker to dance past them, against Watford we lost because of a weak clearance from de Roon. Against Spurs we lost because our defenders went awol. Not once have I seen us concede a goal because of poor keeping, yet apparently Valdes is rubbish and not as good as Dimi, really? Based on what objective, measurable criteria? In the summer I posted that I didn’t think that many of the Boro players would make the grade at premiership level, I was told that the Boro players who got us promoted ‘deserved’ their chance in the premiership, posters who said that are now moaning about the teams performance and blaming the manager, who it would appear doesn’t deserve his ‘chance’ in the premiership, despite being the architect of promotion and the man who saved us from relegation to League one (forgotten?). In the closing days of Mogga’s reign the team on the pitch was in disarray, they didn’t know what they were doing, that was down to the manager. I have seen no sign what so ever of the current Boro team in the premiership not knowing what they are doing. They have a game plan, they know it and they stick to it. The problem is the players keep making mistakes and we concede then lose/draw. There’s no easy answer, its certainly not Hignett or Ince. We’ve got to grind it out, it was as predictable as night following day. Redcar says he predicted the Watford result etc two weeks before it came, well I predicted how this premiership season would pan out months before it came. It’s tough, I have every intention of enjoying the ride, no matter how bumpy. The general feeling is that Dimi may (or may not) have struggled in the Prem but having set a record in clean sheets along with his defence was entitled (arguably earned the respect if not the right) to be given an opportunity which he may or may not have achieved in. What I had seen of Valdes before his arrival did not impress me personally, I believed him to be highly overrated. He does not command his box, does not come out for crosses and now has a very clear and obvious disconnect with his defence and they with him. He will be commanding a sizeable chunk of our wage bill and in harsh commercial terms is he better than what we already had at the club? For the amount of shots he has been exposed to we have conceded a high proportion of them. Granted they are not all his fault, players dancing through our defence at will is not his fault, them dropping too deep and not pushing out is not his fault although perhaps yelling at them and having dialogue may help. Being on the same wave length and coming off his line would also help and build confidence and trust. In stature he is nowhere near the claimed six foot and that is a concern at this level, my guess is he is the shortest Keeper in the division. Shay Given wasn’t blessed with height either but he was blessed with agility, a spring like leap and came out for crosses and constantly organised his back line, barking instructions and flagging up warnings and concerns. In quiet spells Shay also constantly patrolled his 18 yard box keeping alert, leaping and stretching, making markers in the turf so he knew where his angles where in busy situations (much to the annoyance of the Groundsman). He conveyed and exuded confidence and trust to the fans and his defence. At times he even came out of his box and ran 10 yards up the pitch to have a “quiet word”. That is the value a top class experienced keeper can add to the side. That is what we incorrectly assumed we were getting with Valdes but you know what they say about assumptions. Paul Smith stepped in a few years back and was appreciated, so was Carl Ikeme. Boro fans recognise the difference a good keeper does or does not make. Dimi was the quiet man and done none of those things but the defence worked with him and vice versa and not without the odd clanger. On the goals conceded a few extra inches may have been useful for a couple of them and against Everton I wouldn’t say he was blameless, more lost. The bottom line is with Valdes we thought we were getting a Porsche but it looks and drives like a Mondeo. Nothing wrong with Mondeos so long as that is what was specified and paid for. His arrival was supposed to be a competitive edge, experience which would add benefit, a seasoned pro at the top of his game at the right age for a keeper. His lay off with injury undoubtedly will not have helped him but he doesn’t look an imposing, experienced commanding Keeper who adds value to our back line. He makes our defenders nervous and he makes the fans nervous which has now lead to niggly disputes on the pitch. “In the summer I posted that I didn’t think that many of the Boro players would make the grade at premiership level, I was told that the Boro players who got us promoted ‘deserved’ their chance in the premiership, posters who said that are now moaning about the teams performance and blaming the manager, who it would appear doesn’t deserve his ‘chance’ in the premiership, despite being the architect of promotion and the man who saved us from relegation to League one (forgotten?)”. Which Posters who said that the Championship players deserved their chance are now moaning about them? None that I see or read on here. The “moaning posts” are focused around selection, recruitment and tactics not our Championship players not even George Friend who has had a very tough transition. Ramirez is probably the only one being taken to task. Why should our “architect of promotion” be treated differently to our “architect of clean sheets” along with those defenders in front. Dimi was unceremoniously dumped, Mogga got the club out of a financial mire yet paid the price for his lack of progress, so did Robbo who dragged us kicking and screaming into the Riverside, Ravanelli, Promotions and Cup Finals . When did last seasons results ever keep any Football Manager in a job, AK is now the fifth longest serving Manager in the Premiership. The Players who are being moaned about are largely the new intakes. We had 11 new players come in early but how many of them have been a huge success and lifted the club to a higher level and we are 20% into the Season already. Its the existing Championship players that are carrying the side at the moment. We allow most teams very few chances (part of the reason we create so few of course, everyone has one eye over their shoulder!). So as RR asks, why have we conceded so many, proportionately? Silly individual errors really haven’t helped. If we stopped giving away the cheap goals things would look a lot better. If I was looking for one thing to give me hope of a change in form I might start there. Reading a lot of opinions on our summer recruitment, the recurring question is whether this squad is actually an improvement. I think that is unfair, as it’s impossible to disprove. What’s clear is our competition is certainly better. Would last year’s squad have competed any better against far better players in the Prem this year? Probably not. Would this squad have competed just as well in the champ last year? Probably, but we’ll never know. I also think people using Rhodes against AK is unfair. I don’t know if AK rates him, if he resents him being bought or just doesn’t know what to do with him. Suggesting he won’t play him out of stubbornness doesn’t wash with me. The same voices like to harangue him for only playing Forshaw when injuries forced his hand. Maybe, but that’s football, he grabbed his chances and hasn’t looked back. It’s not like AK has dropped him straight back into oblivion. Strikes me AK is pragmatic and far from emotional about these things. I’m sure Rhodes will get his chance. If he grabs it he’ll get a run. He didn’t grab it last year – he got some important goals but not enough. I think there was actually a reference to it being a similar situation to Mogga at Barnsley earlier in the thread. You what. “The Chile international will have to return to the left side of Arsenal’s attacking midfield, where he will cause many problems to a particular Boro weak spot in right-back Antonio Barragan”. “In form attackers Mesut Ozil and Theo Walcott, alongside Perez and Sanchez will look to test a goalkeeper, who isn’t short of mistakes in Victor Valdes as much as possible”. Its not just the “Moaners” on here than who have spotted the obvious! Dimi ‘Architect of clean sheets’!! Yer jokin aren’t yer? Spin if ever I read it. Redcar – you know as well as I do, if it is argued that a championship player deserves his chance for getting promoted then the manager that coached him, trained him, bought him and told him what tactics to play clearly does as well. To differentiate between a player ‘deserving’ a chance but a manager not just demonstrates to me that an easy scapegoat is being sought to blame in the event that the fear of relegation comes to pass. Valdes by the way was regarded by many as one of the best keepers in the world, do you really believe Guardiola played him at Barca because it didn’t matter whether there was a good keeper in goal or not, or that the world cup winning Spain manager did the same? Managers play the very best players they can, why wouldn’t they? You may not like Valdes but that doesn’t make him rubbish. He’s had an average start to the season I agree, but he hasn’t made the mistakes that the defenders & midfielders in front of him have. There is always a player in the team that I take a dislike to, more often than not I keep it to myself, but I’m willing to acknowledge that its an emotional reaction rather than a professional assessment. AK didn’t bring Dimi in. AK brought brought Mejias in and we all know how that went. Dimi was brought in by Mogga. AK’s first choice was a massive liability and not up to the job so there is no way any plaudits for Dimi’s achievements can be laid at AK’s door. What tactics did he tell Dimi to play that he couldn’t coach his preferred option Mejias to play yet Mejias had worked with him previously at Madrid. It isn’t exactly a ringing endorsement of his or Leo’s Goalkeeping judgement is it? As regards Guardiola and Goalkeepers well that story is becoming more comical with every passing week. Have a look at the Man City sites to see what their opinion of Bravo is over Joe Hart. I don’t dislike Valdes I just think he’s an accident waiting to happen whose physique and skill sets are totally unsuitable for the Premier League and like Mejias before him will not finish the Season as No.1. Our defenders are clearly of the same opinion and on more than one occasion. As pasted above, Arsenal have identified him as having a mistake in him. Thats nothing to do with my opinion. Just had a look at the poll on the Gazette about the formation for Arsenal. Over 70% have voted to change the formation at the Emirates. Last time we played 442 there we were destroyed 7-0. 442 at Arsenal would be tantamount to suicide. We need to keep it tight and have some pace in the side to give us any chance. The formation is such a red herring. No-one seems to mention the fact Watford played 5-4-1 on Saturday!! I keep saying that but play two up front at the emirates at your peril. It is all about playing with intent and purpose. At last, something we agree on BP, the formation is not the problem. As Ian constantly reminds us, it is about playing with intent. I just want to see a bit more intent.